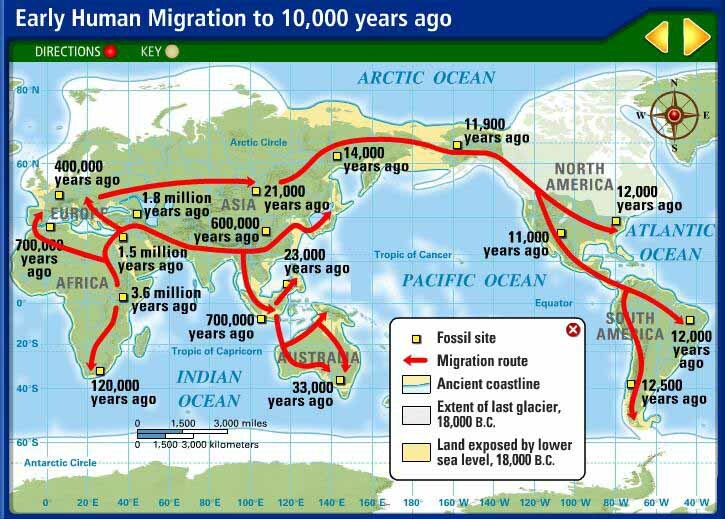 Human migration is physical movement by humans from one area to another, sometimes over long distances or in large groups. Historically this movement was nomadic, often causing significant conflict with the indigenous population and their displacement or cultural assimilation. Only a few nomadic people have retained this form of lifestyle in modern times. Migration has continued under the form of both voluntary migration within one's region, country, or beyond and involuntary migration (which includes the slave trade, trafficking in human beings and ethnic cleansing). Scientists have found that the first movement of early humans out of Africa was not as hard as previously thought. The initial expansion out of the continent and into the Arabian peninsula has been found to be a result of a 'range expansion' of early hominids. Previous research has claimed it was driven by the adaptations of early humans who had evolved to become better suited to the unexplored region. These latest findings reveal that the hominids were in fact not driven by their adaptations but by a need to expand and occupy new territory. Ancient tools and bones discovered in China by archaeologists suggest early humans left Africa and arrived in Asia earlier than previously thought.The artifacts show that our earliest human ancestors colonized East Asia over two million years ago. The tools were discovered at a locality called Shangchen in the southern Chinese Loess Plateau. The oldest are ca. 2.12 million years old, and are c. 270,000 years older than the 1.85 million year old skeletal remains and stone tools from Dmanisi, Georgia, which were previously the earliest evidence of humanity outside Africa. For years, scientists believed that humans evolved in a single spot in Africa and this large band of people spread around the world. It is as though there was a ÔGarden of EdenÕ, where humanity first began, before going forth and multiplying. But a new study says the fossil record does not support humans being fully formed when they spread across the world. Instead early humans had a huge variation in the sizes and shapes of their heads, undergoing a series of genetic and cultural shifts that led to modern humanity. A new genetic study of ancient individuals in the Americas and their contemporary descendants finds that two populations that diverged from one another 18,000 to 15,000 years ago remained apart for millennia before mixing again. This historic reconvergence occurred before or during their expansion to the southern continent. A geological study provides compelling evidence to support the hypothesis that ancient humans migrated into the Americas via a coastal route. By analyzing boulders and bedrock, a team shows that part of a coastal migration route became accessible to humans 17,000 years ago. During this period, ancient glaciers receded, exposing islands of southern Alaska's Alexander Archipelago to air and sun -- and, possibly, to human migration. The story of mankind's early history may have to be rewritten, thanks to a fossilized finger bone from an early modern human dating back around 88,000 years. Experts found the remains in the deserts of Saudi Arabia, suggesting that early migration out of Africa into Eurasia was more expansive than previously thought. It is the oldest directly dated Homo sapien fossil outside of the continent or the Levant, the area around what is now Israel, Palestine and the Lebanon. The three centimetre (1.25 inch) long middle finger is around 20,000 years older than the date from which modern humans were thought to have left Africa. The DNA of a six-week-old Native American infant who died 11,500 years ago has rewritten the history of the Americas. The young girl's genes reveal the first humans arrived on the continent 25,000 years ago - much earlier than some studies claim - before splitting into three Native American groups. This is the first time that direct genetic traces of the earliest Native Americans have been identified. The girl belonged to a previously unknown population of ancient people in North America known as the 'Ancient Beringians.' This small Native American group resided in Alaska and died out around 6,000 years ago, researchers claim. Easter Island is a place of mystery that has captured the public imagination. Famous for ancient carved statues and a location so remote it boggles the mind, the island presents a captivating puzzle for researchers eager to understand how and when it became inhabited, and by whom. New paleogenomic research conducted by an international team led by UC Santa Cruz sheds light on those questions by ruling out the likelihood that inhabitants of Easter Island intermixed with South Americans prior to the arrival of Europeans on the island in 1722. The mystery of how Easter Island came to be inhabited looks set to remain unsolved, after DNA analysis revealed Native Americans did not help to populate the island. Archaeologists have suggested that sea travel between Polynesia and the Americas was plausible, leading to the intermingling of these cultures in its early history. The latest study suggests that European explorers who arrived at the island, known indigenously as Rapa Nui, in the 18th century brought South Americans with them. For many years, it was believed that a single wave of ancient immigrants made their way from Asia to North America and eventually to South America - the first people to exist in the New World. But that view has been challenged in more recent years. In this new effort, the researchers describe evidence they have found that suggests the first settlers of the New World may have come from more than one place. Ancient DNA has revealed the first inhabitants of Vanuatu and Tonga came from Asia, not other Oceanic populations as has long been assumed, a study published Tuesday found. The study sheds light on the last great human migration into unpopulated lands, when a people called the Lapita fanned out into the South Pacific about 3,000 years ago. Little is known of the mysterious culture beyond their distinctive dotted pottery and the human remains they left behind. Scientists had speculated that they were an offshoot of Australo-Papuan populations of Australia, New Guinea and the Solomon Islands, who arrived in the region 40,000-50,000 years ago. A group of humans migrating out of Africa some 40,000 to 70,000 years ago mingled with an as-yet unknown branch of humanity, researchers say. Modern humans originated about 150,000 to 200,000 years ago in Africa. However, scientists have long debated when and how the modern human lineage spread out of Africa to nearly every corner of the globe. Nearly everyone outside Africa descended from an exodus that occurred between 40,000 and 70,000 years ago, but recent archaeological findings and climate models suggest that migrations of modern humans from Africa began at least 100,000 years ago. One way to find out whether, in the past, modern humans dispersed from Africa in one wave or many - and to see if they intermingled with any other human lineages along the way - is to examine the genomes of present-day modern humans. Researchers have revealed that the genetic ancestries of many of sub-Saharan Africa's populations are the result of historical DNA mixing events, known as admixture, within the last 4,000 years. Their study, to be published in the journal eLife, uncovers signatures of these admixture events through a large analysis of DNA from populations across the continent. The discovery provides a foundation for the recent genetic history of the continent, which could aid future studies of non-communicable and infectious diseases, such as malaria. While admixture has been demonstrated in other regions of the world, the new analysis has allowed the team to characterise sub-Saharan Africa's mixing events in an unprecedented level of detail. New research by an archaeologist suggests that betrayals of trust were the missing link in understanding the rapid spread of our own species around the world. The speed and character of human dispersals changed significantly around 100,000 years ago. Before then, movement of archaic humans were slow and largely governed by environmental events due to population increases or ecological changes. Afterwards populations spread with remarkable speed and across major environmental barriers. The small bodies of infants buried in an ancient campsite in the wilds of Alaska have given researchers a surprising and unprecedented look into the lives of prehistoric peoples and the ancient lineages of Native Americans. These rare bones are said to be the earliest human remains found in northern North America. Fossil finds from China have shaken up the traditional narrative of humankind's dispersal from Africa. Scientists working in Daoxian, south China, have discovered teeth belonging to modern humans that date to at least 80,000 years ago. This is 20,000 years earlier than the widely accepted "Out of Africa" migration that led to the successful peopling of the globe by our species. Teeth from a cave in China suggest that modern humans lived in Asia much earlier than previously thought, and tens of thousands of years before they reached Europe, researchers say. This discovery yields new information about the dispersal of modern humans from Africa to the rest of the world, and could shed light on how modern humans and Neanderthals interacted, the scientists added.Modern humans first originated about 200,000 years ago in Africa. When and how the modern human lineage dispersed from Africa has long been controversial. Researchers extracted DNA from a 4,500-year-old skull that was discovered in the highlands of Ethiopia. A comparison with genetic material from today's Africans reveals how our ancient ancestors mixed and moved around the continents. This has left a genetic legacy, and the scientists believe up to 25% of the DNA of modern Africans can be traced back to this event. Two separate genetic analyses have found evidence for a surprising genetic link between the native populations of the Americas and Oceania. The DNA of some native Amazonians shows significant similarity to indigenous inhabitants of Australia and Melanesia. Native Americans living in the Amazon bear an unexpected genetic connection to indigenous people in Australasia, suggesting a previously unknown wave of migration to the Americas thousands of years ago, a new study has found. There's a strong working model in archaeology and genetics, of which I have been a proponent, that most Native Americans today extend from a single pulse of expansion south of the ice sheets - and that's wrong. We missed something very important in the original data. Previous research had shown that Native Americans from the Arctic to the southern tip of South America can trace their ancestry to a single "founding population" called the First Americans, who came across the Bering land bridge about 15,000 years ago. New research suggests that European and Asian (Eurasian) peoples originated when early Africans moved north - through the region that is now Egypt - to expand into the rest of the world. The findings answer a long-standing question as to whether early humans emerged from Africa by a route via Egypt, or via Ethiopia. The major gateway for modern humans out of Africa may have been Egypt, a new genetic analysis suggests. This finding may helps scientists reconstruct how humans evolved as they wandered across the globe, the researchers added. Modern humans first arose about 200,000 years ago in Africa south of the Sahara. When and how the modern human lineage crossed the Sahara and dispersed from Africa has long been controversial. Previous research suggested the exodus from Africa started between 70,000 and 40,000 years ago. However, a recent study hinted that modern humans might have begun their march across the globe as early as 130,000 years ago, and continued their expansion out of Africa in multiple waves. An ancient human skull and a jawbone found a few meters away in a cave in northern Laos add to the evidence that early modern humans were physically quite diverse. The skull, found in 2009 in a cave known as Tam Pa Ling in the Annamite Mountains of present-day Lao is the oldest modern human fossil found in Southeast Asia. Its discovery pushed back the date of modern human migration through the region by as much as 20,000 years. It revealed that early humans who migrated to the islands and coasts of Southeast Asia after migrating out of Africa also traveled inland much earlier than previously thought, some 46,000 to 63,000 years ago. The jaw was discovered in late 2010 and is roughly the same age as the skull. Unlike the skull, it has both modern and archaic human trait. DNA analysis has revealed evidence for a massive migration into the heartland of Europe 4,500 years ago. Data from the genomes of 69 ancient individuals suggest that herders moved en masse from the continent's eastern periphery into Central Europe. These migrants may be responsible for the expansion of Indo-European languages, which make up the majority of spoken tongues in Europe today. Analysis show that 7,000-8,000 years ago, a closely related group of early farmers moved into Europe from the Near East, confirming the findings of previous studies. The farmers were distinct from the indigenous hunter-gatherers they encountered as they spread around the continent. Eventually, the two groups mixed, so that by 5,000-6,000 years ago, the farmers' genetic signature had become melded with that of the indigenous Europeans. But previous studies show that a two-way amalgam of farmers and hunters is not sufficient to capture the genetic complexity of modern Europeans. A third ancestral group must have been added to the melting pot more recently. 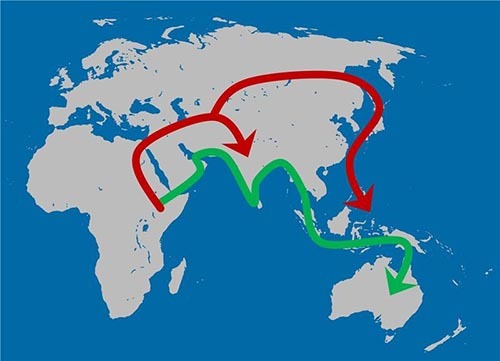 Scientists have shown that anatomically modern humans spread from Africa to Asia and Europe in several migratory movements. The first ancestors of today's non-African peoples probably took a southern route through the Arabian Peninsula as early as 130,000 years ago, the researchers found. Modern humans may have dispersed in more than one wave of migration out of Africa, and they may have done so earlier than scientists had long thought, researchers now say. Modern humans first arose between 100,000 and 200,000 years ago in Africa. But when and how the modern human lineage then dispersed out of Africa has long been controversial. Scientists have suggested the exodus from Africa started between 40,000 and 70,000 years ago. However, stone artifacts dating to at least 100,000 years ago that were recently uncovered in the Arabian Desert suggested that modern humans might have begun their march across the globe earlier than once suspected. Did the Polynesians beat Columbus to South America? Not according to the tale of migration uncovered by analysis of ancient DNA from chicken bones recovered in archaeological digs across the Pacific. The ancient DNA has been used to study the origins and dispersal of ancestral Polynesian chickens, reconstructing the early migrations of people and the animals they carried with them. Evolutionary analysis applied to the relationship between North American and Central Siberian languages may indicate that people moved out from the Bering Land Bridge, with some migrating back to central Asia and others into North America. A study of the full genetic code of a common human virus offers a dramatic confirmation of the "out-of-Africa" pattern of human migration, which had previously been documented by anthropologists and studies of the human genome. The virus under study, herpes simplex virus type 1 (HSV-1), usually causes nothing more severe than cold sores around the mouth, says Curtis Brandt, a professor of medical microbiology and ophthalmology at UW-Madison. Brandt is senior author of the study, now online in the journal PLOS ONE. Modern humans left Africa twice as early as previously thought, spreading in a number of climate-driven waves, new research suggests. The paper, published in Quaternary International, pours fresh doubt on the previously-held consensus that humans spread from Africa in a single cohort. The consensus view has been that modern humans left Africa around 60,000 years ago by a coastal route, skirting around some very arid places, and spread to Australia very quickly. Previous attempts to put a date on the exit of modern humans from Africa have relied heavily on evidence from genetics and archaeology. Australia experienced a wave of migration from India about 4,000 years ago, a genetic study suggests. It was thought the continent had been largely isolated after the first humans arrived about 40,000 years ago until the Europeans moved in in the 1800s. Long before Europeans settled in Australia humans had migrated from the Indian subcontinent to Australia and mixed with Australian aborigines. Indians migrating to Australia more than 4,000 years ago may have introduced dingoes to the island continent, along with novel stone tools and new ways to remove toxins from edible plants, researchers say. Australia was thought to have remained largely isolated from the rest of the world between its initial colonization about 40,000 years ago by the ancestors of aboriginal Australians and the arrival of Europeans in the late 1800s. The biggest survey of Native American DNA has concluded that the New World was settled in three major waves. But the majority of today's indigenous Americans descend from a single group of migrants that crossed from Asia to Alaska 15,000 years ago or more. Previous genetic data have lent support to the idea that America was colonized by a single migrant wave. An international team of researchers have published their findings in the journal Nature. If your heritage is non-African, you are part Neanderthal, according to a new study in the July issue of Molecular Biology and Evolution. Discovery News has been reporting on human/Neanderthal interbreeding for some time now, so this latest research confirms earlier findings. Damian Labuda of the University of Montreal's Department of Pediatrics and the CHU Sainte-Justine Research Center conducted the study with his colleagues. They determined some of the human X chromosome originates from Neanderthals, but only in people of non-African heritage. "This confirms recent findings suggesting that the two populations interbred," Labuda was quoted as saying in a press release. A team of scientists from the NIOZ Royal Netherlands Institute for Sea Research and the University of Bremen (Germany) has determined that a major change in the climate of the Sahara and Sahel region of North Africa facilitated early human migrations from the African continent. The team's findings will be published online in the Nov. 9th installment of Early Edition of the Proceedings of the National Academy of Sciences USA. Among the key findings are that the Sahara desert and the Sahel were considerably wetter around 9,000, 50,000 and 120,000 years ago than at present, allowing for the growth of trees instead of grasses. The first people to arrive in America traveled as at least two separate groups to arrive in their new home at about the same time, according to new genetic evidence published online in Current Biology. After the Last Glacial Maximum some 15,000 to 17,000 years ago, one group entered North America from Beringia following the ice-free Pacific coastline, while another traversed an open land corridor between two ice sheets to arrive directly into the region east of the Rocky Mountains. (Beringia is the landmass that connected northeast Siberia to Alaska during the last ice age.) Those first Americans later gave rise to almost all modern Native American groups of North, Central, and South America, with the important exceptions of the Na-Dene and the Eskimos-Aleuts of northern North America, the researchers said. The tiny, prehistoric seashells swirl, spiral, and twist. Some curl like soft-serve ice cream, others sport crowns of fragile, hollow spines. They evoke tropical reefs, but geologist David Rohr found them lodged in gray Alaskan limestone. These 18 Paleozoic-era snails - half of them new to science - did live on reefs some 420 million years ago, when jawless fishes spread throughout the seas and the ancestors of spiders and centipedes began creeping about on land. Innovation - not climate change - may have triggered early humans' migration out of Africa, a new study suggests. For early Homo sapiens, periods of population movement coincided with social advances and tool-making innovation, the work found. A clump of frozen human hair from northwest Greenland suggests that the first Eskimos in the New World did not descend from Native Americans as previously thought but came directly from Asia, a new study says. Furthermore, these pioneer settlers of the far north later died out and did not give rise to the Inuit living in Greenland today. A new study has found genetic traces of both the arrival of the Crusades and of the expansion of Islam in Lebanon. The findings not only confirm well-documented history but also present a rare genetic trail showing the movement of two major religions into Lebanon, scientists say. Modern humans are known to have left Africa in a wave of migration around 50,000 years ago, but another, smaller group -- possibly a different subspecies -- left the continent 50,000 years earlier, suggests a new study. While all humans today are related to the second "out of Africa" group, it's likely that some populations native to Israel, Jordan, Lebanon, Syria, Australia, New Zealand and Indonesia retain genetic vestiges of the earlier migrants. Nearly all of today's Native Americans in North, Central, and South America can trace part of their ancestry to six women whose descendants immigrated around 20,000 years ago, a DNA study suggests. Those women left a particular DNA legacy that persists to today in about about 95 percent of Native Americans, researchers said. A consensus is emerging in the highly contentious debate over the colonization of the Americas, according to a study that says the bulk of the region wasn't settled until as late as 15,000 years ago. Researchers analyzed both archaeological and genetic evidence from several dozen sites throughout the Americas and eastern Asia for the paper. Today, we are a global species, that is, found on every continent, because 200,000 years ago fully modern humans pulled up stakes and took off. First we moved out of Africa, going north and then around the Mediterranean, spreading quickly into Europe, the Balkans and the Middle East. Following in the footsteps of Homo erectus, much earlier ancestors, modern humans then laced up their walking shoes again and headed out across the globe, not even stopping when faced with water. Wide Pacific? No problem. We built boats and sailed across ocean, populating islands as we went. Did a relatively small number of people from Siberia who trekked across a Bering Strait land bridge some 12,000 years ago give rise to the native peoples of North and South America? Like following a trail of genetic breadcrumbs, researchers have used pig DNA to reconstruct the migration route of humans out of Asia and into the Pacific. The porcine clues have revealed that the story is more complex than long-held theories suggest. Based on their evidence, the scientists say that various pig-toting cultures from Vietnam traveled south through the Malaysian Peninsula into the Indonesian islands of Sumatra and Java and into the Lesser Sunda Islands. Archaeologists working on the Pacific islands of Vanuatu have found the region's oldest cemetery, and it's filled with a slew of headless bodies. The peculiar 3,000-year-old skeletons belong to the Lapita people, the earliest known inhabitants of the Pacific Islands. Their DNA could shed light on how the many remote island specks surrounding Vanuatu were colonized, the researchers say. "Both Vanuatu and Western Polynesia were first settled by the Lapita culture but their populations are somewhat different genetically and this has not yet been explained," said dig leader Matthew Spriggs, an archaeologist with the Australian National University. The Vanuatu burials --which include mismatching bodies and heads of individuals from different corners of the Pacific Islands - could help explain how everyone eventually ended up where they did, he said. Maps are tools to show you where you are going, but they can also show you where you came from. That principle drives the work of Roberto Rodr’guez and Patrisia Gonzales, who study ancient maps, oral traditions and the movement of domesticated crops to learn more about the origins of native people in the Americas.